I arrived at Langdon Court in the morning welcomed by Alex and her bridesmaids. They were all busy spread across the rooms preparing their make up and enjoying the early stages of the day. I started with photographing all the special and important bridal details before attending to the girls. Later we were welcomed with Alex's niece and nephew with her niece sporting her beautiful glittery tiara and shoes! Alex and the girls hair were beautifully styled by Debbie Herbert with Alex, her mum and sister's make up by Emma Green. Alex's maid of honour helped with the finishing touches before revealing the bride to the rest of the girls. The ceremony took place at Wemburgh Church looking out on to the coast. I said my hello's to Lewis where he was greeting the guests into the church. Wemburgh is a beautiful intimate place and it was perfect for the couple and their guests. Alex arrived at the church shortly after her bridesmaids with emotions building all round. The bridal party along with the brides father waited excitably outside the church door ready to enter. With Lewis eagerly waiting for her, Alex walked down the aisle to him with Lucy Anna singing. The ceremony was intimate, emotional and humorous! After the vows, readings and signing of the registrar the couple walked out into a shower of confetti from all their guests. While the guests moved on to the reception at Langdon Court where they were welcomed with a set from Lucy Anna - the couple and myself spent some moments together around the church for some bride and groom photos. The rain started to kick in but it wasn't going to stop everyone enjoying the day. 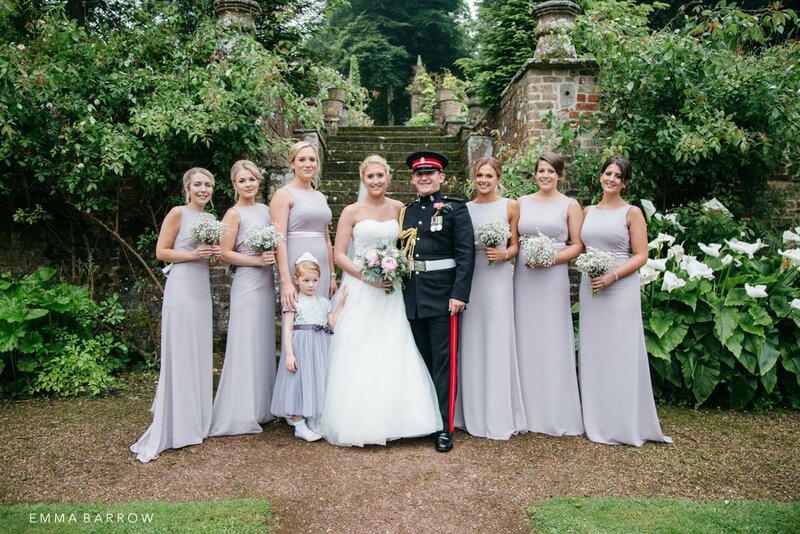 We carried on and continued to photograph more bridal images at Langdon Court around their stunning grounds. The gardens and venue were truly perfect for the couples theme. I just love the flowers by H Watts. After the bridal photos we moved swiftly into the formal photos in the gardens of Langdon. The venue was beautifully decorated throughout with the couple putting their own touch to it. After a delicious three course meal it was time for the speeches! Full of laughter, embarrassment and memorable stories. Evening guests were welcomed and were entertained with the instax camera and pic n mix. Double Decks Disco provided the musical entertainment all night for the guests kicking things off with the first dance and bouquet throw! Ending the night for me was the cake cut with the wedding cake by 'Little Lark Cake company' and the couple also had cheese cakes! I love the toppers! Groom/Groomsmen - Suits: Moss Bros.